At first, it seemed like a small story. The royal editor of the News of the World was caught listening to the voice mail messages of staff at Buckingham Palace. He and a private investigator were jailed, and the case was closed. But Nick Davies, special correspondent for the Guardian, knew it didn't add up. 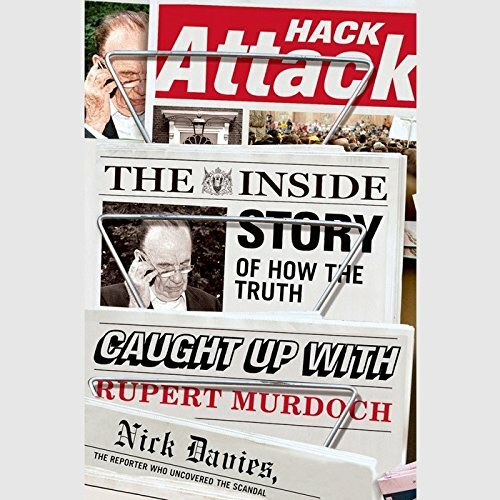 He began to investigate and ended up exposing a world of crime and cover-up, of fear and favor--the long shadow of Rupert Murdoch's media empire.Hack Attack is the mesmerizing story of how Davies and a small group of lawyers and politicians took on one of the most powerful men in the world and emerged victorious. It exposes the inner workings of the ruthless machine that was the News of the World and of the private investigators who hacked phones, listened to live calls, sent Trojan horse emails, bribed the police, and committed burglaries to dig up tabloid scoops. Above all, it is a study of the private lives of the power elite. It paints an intimate portrait of the social network that gave Murdoch privileged access to government and allowed him and his lieutenants to intimidate anyone who stood up to them.Spanning the course of the investigation from Davies' contact with his first source in early 2008 to the resolution of the criminal trial in June 2014, this is the definitive record of one of the major scandals of our time, written by the journalist who was there every step of the way. View More In White Collar Crime. If you have any questions about this product by Blackstone Audiobooks, contact us by completing and submitting the form below. If you are looking for a specif part number, please include it with your message.